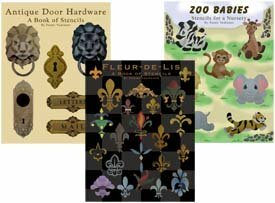 This page is filled with arts and crafts projects for you to create with stencils! These projects are easier than painting on walls or redesigning a piece of furniture. They don’t take as long and some of them offer great opportunities to create art with the kids. If you are new to working with stencils this is a great place to start. Our first project has a Christmas Theme. 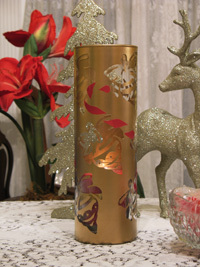 It’s a festive candle holder made from a simple thrift store glass vase. You’ll find the complete instructions, a video to follow along with and some other tips and fun ideas for this project so don’t miss it! And besides the stencils we are using come from our Free Christmas Stencils Page so after you finish the instructions, head over there to print your free stencils. If you're like me, when you're ready to do arts and crafts, you want to get started now and there is no better way to do that than to get a few Free Printable Stencils for a quick start. Just print and Go! 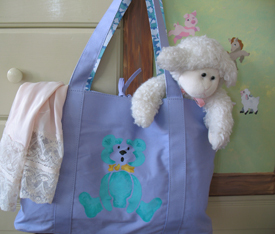 By the way, if this looks like an arts and crafts project for you then scroll down to see a tote just like this one turned into a beach bag with a Free Dolphin Stencil! 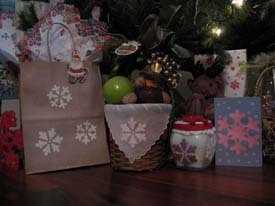 Stencils are not just for painting, they can be used as patterns to cut out designs and make very unique craft work. 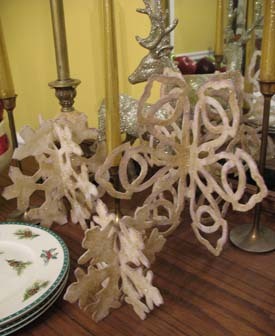 This project created some beautiful 3D Snowflakes that can be used as an elegant centerpiece or as a whimsical treat hanging from the chandelier. Visit our 3D Snowflake Patterns Centerpiece to get all the details and you’ll also find a unique fold template to help you create perfect side sided snowflakes. It’s the little things that bring a touch of class to our decorations. Whether it’s a table setting, holiday arrangement or a special gift, a small emblem personally painted by you makes it special. Visit our Snowflake Crafts Page for a few ideas on placing a simple design on a plain object and watch it transform into a one of a kind accent. Tired of the mess of cleaning a pumpkin at Halloween? No problem... Paint it! They make unique decorations and you can get pretty ornate with paint over carving. This works great on those plastic craft pumpkins too so that you can paint it once and have a pumpkin for life. 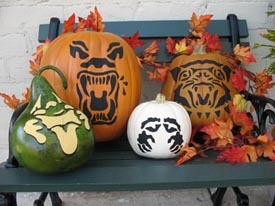 Just visit Halloween Pumpkin Stencils for all the details. Grouping hobbies is a unique way to create art. Stamping and Stenciling Gardening is a wonderful way to combine three of your favorite interests into one great project. Well, have fun with all of these Arts Craft Home Stenciling Ideas. Well, I hope you enjoy these Arts and Crafts Projects. The ability to create and make things brings me so much joy and I hope you get the same from them. Don’t forget that I (and everyone else) want to see what you have done with any of your stenciling arts and crafts projects. Just click on Stenciling Projects to get your masterpiece showcased here on this web site. Won’t that be exciting! Or if you have any questions or want to share information join in on the Stencil Blog. Well, I hope to hear from you soon. Return to Home Page from Arts and Crafts.